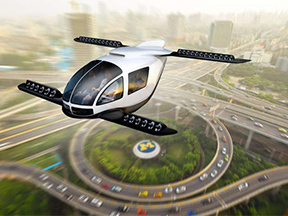 A University of Michigan study of the environmental sustainability impacts of flying cars formally known as electric vertical take-off and landing aircraft, or VTOLs found they could play a niche role in sustainable mobility for longer trips. Flying cars would be especially valuable in congested cities, or in places where there are geographical constraints, as part of a ride-share taxi service, according to study authors from the University of Michigan's Center for Sustainable Systems and from Ford Motor Company. "To me, it was very surprising to see that VTOLs were competitive with regard to energy use and greenhouse gas emissions in certain scenarios," says Gregory Keoleian, senior author of the study and director of the Center for Sustainable Systems at U-M's School for Environment and Sustainability. "VTOLs with full occupancy could outperform ground-based cars for trips from San Francisco to San Jose or from Detroit to Cleveland, for example," he says. The study, the first comprehensive sustainability assessment of VTOLs, looked at the energy use, greenhouse gas emissions and time savings of VTOLs compared to ground-based passenger cars. Although VTOLs produce zero emissions during flight, their batteries require electricity generated at power plants. The researchers found that for trips of 100 kilometers or more, a fully loaded VTOL carrying a pilot and three passengers had lower greenhouse gas emissions than ground-based cars with an average vehicle occupancy of 1.54. Emissions tied to the VTOL were 52 percent lower than petrol vehicles and 6 percent lower than battery-electric vehicles, the study found. Electric vehicles and automated driving may contribute to some of those goals but are limited by congestion on existing roadways. VTOLs could potentially overcome some of those limitations by enabling piloted taxi services or other urban and regional aerial travel services. But for shorter trips—less than 35 kilometers—single-occupant internal-combustion-engine vehicles used less energy and produced fewer greenhouse gas emissions than single-occupant VTOLs. That's important say the researchers because the average ground-based vehicle commute is only about 17 kilometers. The study's authors note that many other questions need to be addressed to assess the viability of VTOLs, including cost, noise and societal and consumer acceptance.